I am studying masters in the UK and living with my 2 children and husband for only since this September, 2018. In my home country we lived with my mom as well and now she lives in our house with my brother and his family. As my mom has lived with us for the last 4 years i wanted to invite to visit us more often until our visas are expired, Jan, 2020. She applied for 2 year visa, 3 months for the first visit, 1.5 months for the second during school break and 2 weeks for my graduation ceremony. 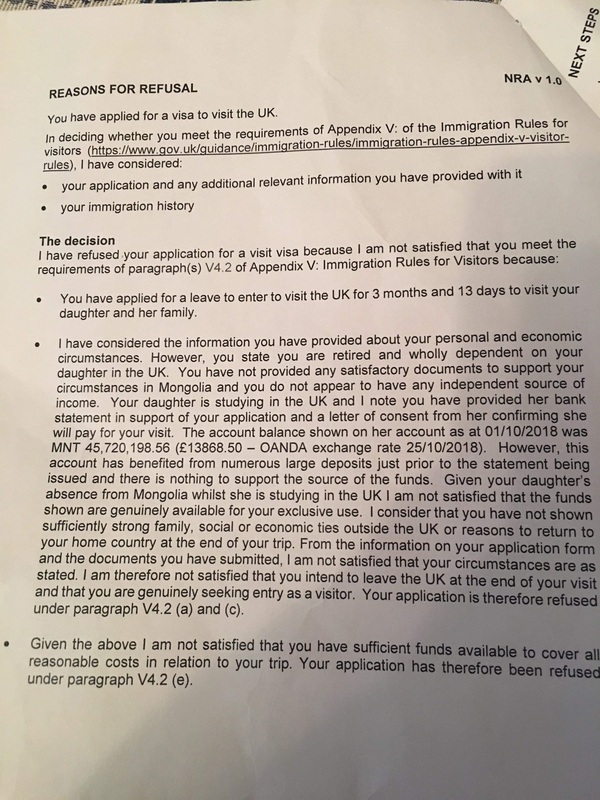 But her visa has been rejected based on UK visa immigration rule of V 4.2 a, c and e. Pls see the full refusal letter. Basically she was rejected because she doesn't have her own source of fund although we provided the evidence of her monthly pension which is very small (200$) and i will fund her. She lived in another city before moving to our house and she had a property which she has a copy of certificate but very old from 2013. She didn't include it as it is now on my cousin's name and she doesn't live at that address. This large deposit made is because i sold my car to support her application which is additional fund to my family expense in the UK. I am a full Scholarship holder for myself only from the UK government and provided evidence of my fund as some portion of savings, the income from selling our garage, for my husband and children's visa. My mom now lives in our house with my brother and his family during our absence. He supports her in addition to her monthly pension. He has has also 2 children and wife who is not working. So i didn't include anything about themselves. My mom will definitely go back to the country but i don't know how to demonstrate that strongly. Should i now try again but for 6 month visa for 2 months as 3 months seems to be long for a visit. My mom looked after my children most of the time as me and my husband are busy with work so they are very close. I would like my mom to visit my family and spend time with my children as they miss her. Please advise how i should demonstrate strong evidence against the refused grounds and any solicitor who is affordable please recommend. Browse other questions tagged visas uk visa-refusals long-term mongolian-citizens or ask your own question.